Tough and tolerant daylilies have grown out of their their original, uninspiring moniker of "ditch-lilies." Appreciative gardeners have taken the common reds and oranges to produce a vast array of colors, including pink, white, gold, purple and bi-colors. 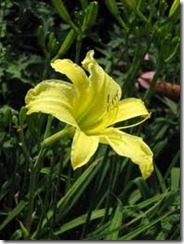 Not only satisfied with changing the color and flower form, breeders developed daylilies with extended bloom seasons. All American Daylilies and the American Hemerocallis Society, two non-commercial organizations, award annual awards to the best new cultivars. The 2005 winner, Miss Mary Mary produces single, clear yellow blooms during the first flowering. Repeat flowers, however, are double blooms with texture and interest, despite their 3-inch size. This is a compact daylily, with thin, mounding blades reaching just 8 to 14 inches tall. The flower stems are slightly taller, holding the bright gold trumpets just above the foliage. Once Miss Mary Mary starts blooming, it continues flowering until frost. This daylily tolerates both cold and heat, is resistant to disease and is a cheerful addition to flower borders. Miss Mary Mary is suited for USDA Zones 4 to 10. The American Hemerocallis Society awarded Fairy Tale Pink the Stout Medal, an annual award given to one daylily a year. This reblooming daylily produces showy, large flowers over 5 inches wide, at odds with the flower’s delicate appearance. The pastel pink, ruffled petals have darker markings and a green throat, an elegant and classic touch in the garden bed. The pink holds true in harsh sunlight. Fairy Tale Pink tolerates hot weather and is semi-evergreen, making it a good choice for warmer zones. As the name suggests, Frankly Scarlet produces stunning, deep red single flowers. Unlike many brightly colored flowers, this daylily’s petals hold their color and resist fading in bright sunlight. Frankly Scarlet is a prolific bloomer and mature plants may continue reblooming for up to 185 days, even through drought and heat. The thick roots and salt tolerance make this daylily a candidate for erosion control along roadways. Rust very rarely affects Frankly Scarlet, and the foliage mounds from 1 to 2 feet high. It holds the flower scapes even higher, sometimes reaching 30 inches tall. Frankly Scarlet won the All-American Daylilies landscape category in 2003 and is hardy in USDA Zones 4 to 11. In 2008, Summer Valentine swept the All-American Daylily Selection Council’s exhibition and landscape categories. 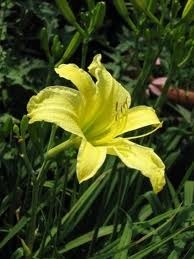 This striking daylily produces large, single trumpets, 5 inches wide or more, on 2-foot-tall scapes. From a yellow center, the deep pink eye soon dominates the petal before a bright white takes over. The picotee edges are also trimmed with a fine, thin line of dark pink, adding a refined but dramatic touch. The foliage arches 17 to 23 inches tall, and Summer Valentine continues the show for up to three months. It grows well in USDA Zones 4 to 10. « Why Are My Daylilies Dying?